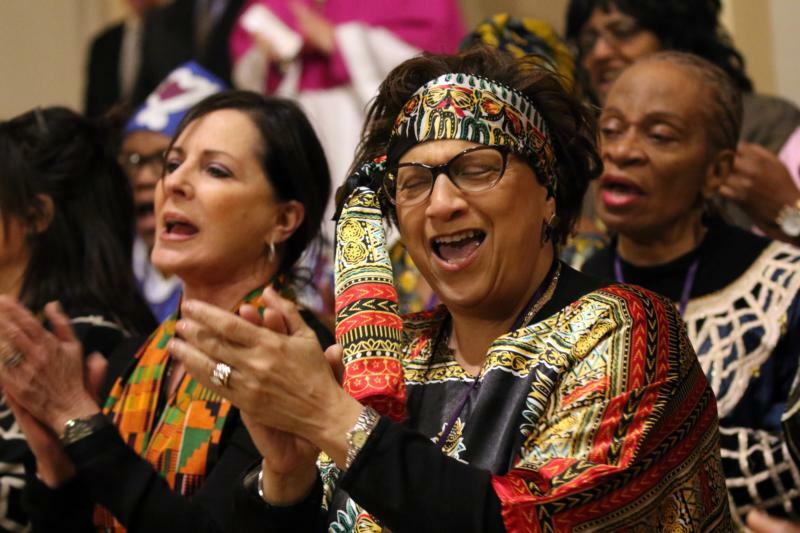 Women with the Sister Thea Bowman Choir of the Diocese of Rockville Centre, N.Y., sing during a prayer service April 4 . at St. Agnes Cathedral in Rockville Centre. “(Jesus) wants us to be saints and not to settle for a bland and mediocre existence,” Pope Francis wrote in his new apostolic exhortation on holiness, “Gaudete et Exsultate” (“Rejoice and Be Glad”). The document was released April 9 at the Vatican. (CNS photo/Gregory A. Shemitz, Long Island Catholic) See POPE-HOLINESS April 9, 2018.
call to holiness, which extends to every baptized Christian. Speaking plainly and using real-life examples, the pope stresses that our encounter with God takes place in the everyday routines of life, where we witness to his love through prayer and service. In this set of articles from our partner Catholic News Service, we explore this encyclical more closely. In the “Food for Thought” section below, we list several quotes from the encyclical for individual reflection. Christ took on our very flesh, choosing to enter into our humanity with all its shortcomings and struggles. In so doing, he affirmed the goodness of this world and restored our dignity. In his Sermon on the Mount, Jesus calls us to radically refocus our priorities so that our lives become a practical witness to his love for all. Through ordinary acts of self-sacrifice and charity, we can reflect God’s presence in the world, drawing others to the love of Christ. Pope Francis outlines five spiritual attitudes necessary when striving for lives of holiness. They are “signs of holiness in today’s world” and “five great expressions of love for God and neighbor,” he wrote. These three qualities demonstrate “solid grounding in the God who loves us” and form an inner strength that “enables us to persevere amid life’s ups and downs,” Pope Francis said. “Christian joy is usually accompanied by a sense of humor,” the pope said. “The saints are joyful and full of good humor,” far from “putting on a dreary face,” he said. “Look at Jesus. His deep compassion … did not make him hesitant, timid or self-conscious as often happens with us. Quite the opposite,” Pope Francis wrote. “Growing in holiness is a journey in community, side by side with others. … A community that cherishes the little details of love, whose members care for one another and create an open and evangelizing environment, is a place where the risen Lord is present,” the pope said.